U.S. District Court Chief Judge Linda Reade sentenced Midamar Corp. President Jalel Aossey on Friday to one year and one day in prison after he pleaded guilty to conspiring to commit fraud. U.S. District Chief Judge Linda Reade said she gave him the extra day, so he could earn “good time” in prison, which is earned time to reduce a prison term, and he wouldn’t have been eligible with only 12 months. Jalel Aossey, 40, will also pay a $30,000 fine for one felony count of conspiracy. He admitted that labels on meat products and documents exported to Malaysia and Indonesia were falsified. He must resign from the Cedar-Rapids, Iowa-based company. His brother, Yahya Aossey, received three years of probation after he pleaded guilty to selling misbranded meat products. He may continue as the head of Midamar. Reade sentenced Yahya Aossey, 45, to three years probation, 200 hours of community service and a $5,000 fine. He was convicted of two misdemeanor counts of selling and transporting meat food products that were misbranded at the time of sale or transportation. 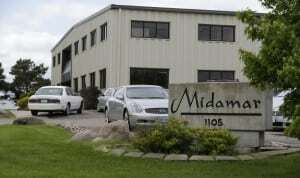 Their father, Midamar founder Bill Aossey, was sentenced in February to two years in prison after being convicted of similar charges. Assistant U.S. Attorney Richard Murphy said, now that the case is wrapped up, he thought all the sentences were “good resolutions for food safety and consumers,” and he was pleased the USDA consent decree helped change the companies operations, which also helped keep them in business. If the USDA hadn’t agree to the consent decree, with Murphy’s persuasion, it may have closed down Midamar because the company had previous violations, Murphy said. Murphy said these were serious violations, which could have affected international trade. He said Malaysia and other countries could have stopped doing business with companies in the states because of this fraud.